The Sahara, located in Northern Africa, is the world's largest hot desert and second largest desert after Antarctica at over 3.5 million square miles (9 million square kilometers). Almost as large as the United States, it crosses the borders of 11 nations. While much of the desert is uninhabited, two million people are scattered across its vast expanses, not including those who live along the Nile and Niger riverbanks. The name Sahara is an English pronunciation of the Arabic word for desert. Immediately after the last ice age, the Sahara was a much wetter place than it is today. Over 30,000 petroglyphs of river animals such as crocodiles exist, with half found in the Tassili n'Ajjer in southeast Algeria. Fossils of dinosaurs, including Afrovenator, Jobaria, and Ouranosaurus, have also been found here. The modern Sahara, though, is not as lush in vegetation, except in the Nile River Valley, at a few oases, and in the northern highlands, where Mediterranean plants such as cypresses and olive trees are found. The region has been this way since about 3000 B.C.E. The boundaries of the Sahara are the Atlantic Ocean on the west, the Atlas Mountains and the Mediterranean Sea on the north, the Red Sea and Egypt on the east, and Sudan and the valley of the Niger River on the south. The Sahara divides the continent into North and Sub-Saharan Africa. The southern border of the Sahara is marked by a band of semiarid savannas called the Sahel; south of the Sahel lies lusher Sudan and the Congo River Basin. Most of the Sahara consists of rocky hammada; ergs (large sand dunes) form only a minor part. The highest part of the desert is at the summit of the volcano Mount Koussi in the Tibesti Mountains, which is 11,204 feet (3,415 meters) high. The lowest point of the Sahara is 436 feet (133 meters) below sea level in the Qattara Depression in Egypt. Considering the hyper-arid conditions, the fauna of the central Sahara is richer than is generally believed. Within this ecoregion there are 70 species of mammals, 20 of which are large mammals. There are also 90 species of resident birds, and around one hundred species of reptiles. Arthropods are also numerous, especially ants. The animals include antelope, gazelles, jackals, hyenas, fennec foxes, rodents, small reptiles, insects, and scorpions. The mountains provide a home for the Barbary sheep, leopards, the addax, and the sand gazelle. The latter has splayed hooves that make it easier to travel in the sand. The fennec fox has large ears to dissipate heat and hairy soles to protect its feet while crossing the desert in search of lizards and locusts. These kinds of adaptations have allowed them to survive in such an inhospitable environment. Many of the animals get their water only through metabolic processes. Animals may lose 30-60 percent of their body mass and still recover. The central Sahara is estimated to include only five hundred species of plants, which is extremely low considering the huge extent of the area. Plants such as acacia trees, palms, succulents, spiny shrubs, and grasses have adapted to the arid conditions, either by reducing water loss or storing water. Plant leaves may dry out totally and then recover. Human activities are more likely to affect the habitat in areas of permanent water (oases) or where water comes close to the surface. Here, the local pressure on natural resources can be intense. The remaining populations of large mammals have been greatly reduced by hunting for food and recreation. In recent years development projects have started in the deserts of Algeria and Tunisia using irrigated water pumped from underground aquifers. These schemes often lead to soil degradation and salinization. Although the Sahara stretches across the entire continent, it can be subdivided into distinctive regions, including. Western Sahara: a series of vast plateaus in Morocco that extend to the foothills of the Atlas Mountains. There is no surface water but dry riverbeds (wadis) that only hold water during rare rainfall. Where the underground rivers that flow from the mountains emerge on the surface, they create small oases. The area contains such minerals as phosphates, iron, zinc, and gold. Great Western Erg and Great Eastern Erg: An immense, uninhabited area in Algeria consisting mostly of sand dunes shaped by the wind into peaks and hollows; the two regions are separated by a rocky plateau. Precipitation is extremely low. Tanezrouft Desert: A rock desert in south central Algeria bisected by deep canyons and known as the "land of terror" because of its lack of water. Tassili N'Ajjer Desert: An extremely arid mountainous area in southern Algeria that once held lakes fed by mountain streams. Wind erosion has created numerous rock formations. Ancient cypresses and wild olive trees grow at the higher altitudes. Cave paintings and Neolithic artifacts dating back six to seven thousand years ago have been found. Today, Tuaregs grow crops around the wadis and oases. Hoggar Desert: A mountainous, largely uninhabited part of Algeria characterized by igneous and volcanic rock formations. The mountains contain caves with ancient paintings depicting cattle, rhinoceros, elephants, giraffes, and jackals. Libyan Sahara: Rock plateaus and sandy plains extend from eastern Libya to northwestern Sudan. A group of oases enables the cultivation of cereals, olives, grapes, and dates. Fezzan Desert: An immense area of alternating sandstone and limestone that form caves and natural arches in southwestern Libya. This region is known for its fossils and Neolithic artifacts and rock drawings of animals. Western and Eastern Egyptian Deserts: The Western Desert covers two-thirds of Egypt's land area and merges into the Libyan Desert. Where there are depressions lower than sea level, several large oases exist, the largest of which is Siwa, which is surrounded by olive plantations. The Eastern Desert spreads between the Suez Canal and the Red Sea. Nomads raise herds of sheep, camels, and goats. Tibesti Mountains: Formed during a period of volcanic eruptions about seventy million years ago, the area now in Chad has numerous prehistoric rock carvings. The Australopithecus hominid known as "Abel" was discovered here. Ténéré Desert: The last southern offshoot of the Sahara, it is an area in Niger of undulating dunes, the most famous of which is the Erg of Bilma. Though now free of vegetation, except for a few oases that once formed the backbone of a caravan track, the desert has rock drawings of animals and fossilized tree trunks that point to wetter times in the ancient past. Aïr Massif: A rocky granite massif in central Niger, its flanks are chiseled by canyons long ago formed by rushing streams that are now dry most of the year. Agriculture takes place around the larger oases. Agadez, on the mountain's southern slopes, is the largest population center in the area. The climate of the Sahara has undergone enormous variation between wet and dry over the last few hundred thousand years. 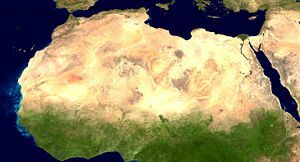 During the last ice age, the Sahara was larger than it is today, extending south beyond its current boundaries. The end of the ice age brought wetter times to the Sahara, from about 8000 B.C.E. to 6000 B.C.E., perhaps due to low pressure areas over the collapsing ice sheets to the north. 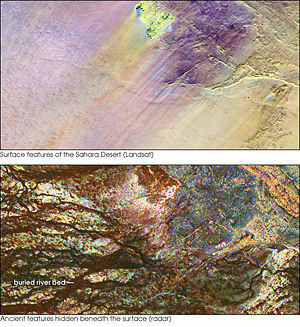 Once the ice sheets were gone, the northern part of the Sahara dried out. However, not long after the end of the ice sheets, the monsoon, which currently brings rain to the Sahel, came farther north and counteracted the drying trend in the southern Sahara. The monsoon in Africa (and elsewhere) is due to heating during the summer. Air over land becomes warmer and rises, pulling in cool wet air from the ocean. This causes rain. Paradoxically, the Sahara was wetter when it received more insolation in the summer. In turn, changes in solar insolation are caused by changes in the earth's orbital parameters. By around 2500 B.C.E., the monsoon had retreated south to approximately where it is today, leading to the desertification of the Sahara. The Sahara is currently as dry as it was about 13,000 years ago. During periods of a wet Sahara, the region became a savanna, and African flora and fauna become common. During the following dry arid period, the Sahara reverts to desert conditions. Evaporation exceeds precipitation, the level of water in lakes like Lake Chad falls, and rivers become dry wadis. Flora and fauna previously widespread retreats northward to the Atlas Mountains, southward into West Africa, or eastward into the Nile Valley and then either southeast to the Ethiopian highlands and Kenya or northwest across the Sinai into Asia. This separated populations of some species in areas with different climates, forcing them to adapt. The Sahara Desert has one of the harshest climates in the world, with strong winds that blow from the northeast. Sometimes on the border zones of the north and south, the desert will receive about 10 inches (25 centimeters) of rain a year. The rainfall is usually torrential when it occurs after long dry periods, which can last for years. Daytime temperatures can reach 58 °C (136 °F), but freezing temperatures are not uncommon at night. Its temperature can become as low as -6 °C (22 °F). According to archeologists, the Sahara was much more densely populated more than twenty thousand years ago when the desert's climate was not as arid as it is today. Fossils, rock art, stone artifacts, bone harpoons, shells, and many other items have been found in areas which today are considered too hot and dry to inhabit. The artifacts were located near remains of giraffe, elephant, buffalo, antelopes, rhinoceros, and warthog, as well as those of fish, crocodiles, hippopotamuses, and other aquatic animals, indicating the presence of lakes and swamps in the Sahara. Between twenty thousand and twelve thousand years ago, severe conditions returned and the Sahara was largely depopulated, except in highland retreats where there were springs and surface pools fed by aquifers. By ten thousand years ago, gatherers and fishers had reoccupied the replenished lakes, streams, and swamps. There are some traces of possible agriculture from eight thousand years ago, and more verifiable evidence of cattle-keeping in the mountains by seven thousand years ago, perhaps in response to more arid conditions. That population would leave again three to four thousand years ago as conditions deteriorated. The Sahara became a largely impenetrable barrier to humans, with only scattered settlements around the oases but little trade. The one major exception was the Nile Valley. By 6000 B.C.E. pre-dynastic Egyptians in the southwestern corner of Egypt were herding cattle and constructing large buildings. Subsistence in organized and permanent settlements centered predominantly on cereal and animal agriculture: cattle, goats, pigs, and sheep. The Nile River, however, was impassable at several cataracts, making trade and contact difficult. The Phoenecians created a confederation of kingdoms across the entire Sahara to Egypt, generally settling on the coasts but sometimes in the desert also. Sometime between 633 and 530 B.C.E., Hanno the Navigator either established or reinforced Phoenician colonies in the Western Sahara, but all ancient remains have vanished with virtually no trace. The earliest crossings of the Sahara, about 1000 B.C.E., were by oxen and horse, but such travel was rare until the third century C.E. when the domesticated camel was introduced. By 500 B.C.E. a new influence arrived in the form of the Greeks. Greek traders spread along the eastern coast of the desert, establishing colonies along the Red Sea coast. The Carthaginians explored the Atlantic coast of the desert but the turbulence of the waters and the lack of markets never led to an extensive presence farther south than modern Morocco. Centralized states thus surrounded the desert on the north and east, but the desert itself remained outside their control. Raids from the nomadic Berber people of the desert were a constant concern of those living on the edge of the desert. An urban civilization, the Garamantes, arose around this time in the heart of the Sahara, in a valley that is now called the Wadi al-Ajal in Fazzan, Libya. The Garamantes dug tunnels far into the mountains flanking the valley to tap fossil water and bring it to their fields. The Garamantes grew populous and strong, conquering their neighbors and capturing many slaves (who were put to work extending the tunnels). The ancient Greeks and Romans knew of the Garamantes and regarded them as uncivilized nomads. However, they traded with the Garamantes, and a Roman bath has been found in the Garamantes capital of Garama. Archaeologists have found eight major towns and many other important settlements in the Garamantes territory. The civilization eventually collapsed after they had depleted available water in the aquifers and could no longer sustain the effort to extend the tunnels. After the Arab invasion of the Sahara, trade across the desert intensified. The kingdoms of the Sahel, especially the Ghana Empire and the later Mali Empire, grew rich and powerful exporting gold and salt to North Africa. The emirates along the Mediterranean Sea sent south manufactured goods and horses. Salt was also exported south, sometimes in caravans of 40,000 camels. Timbuktu became a trading center because of its location on the Niger River. Kola nuts, leather, cotton, and slaves were traded north. This process turned the scattered oasis communities into trading centers and brought them under the control of the empires on the edge of the desert. This trade persisted for several centuries until the development in Europe of the caravel allowed ships, first from Portugal but soon from all Western Europe, to sail around the desert and gather resources from their source. The colonial powers also largely ignored the region, but the modern era has seen a number of mines and communities develop to exploit the desert's natural resources. These include large deposits of oil and natural gas in Algeria and Libya and large deposits of phosphates in Morocco and Western Sahara. Some two million people live in the Sahara, living either a nomadic or settled life wherever they can find food and water. Most of them are in Egypt, Mauritania, Morocco, and Algeria. Dominant ethnicities in the Sahara are various Berber groups including Tuareg tribes, various Arabized Berber groups such as the Hassaniya-speaking Moors (also known as Sahrawis), and various "black African" ethnicities including Tubu, Nubians, Zaghawa, Kanuri, Peul (Fulani), Hausa, and Songhai. The largest city in the Sahara is the Egyptian capital Cairo, in the Nile Valley. Other important cities are Nouakchott, the capital of Mauritania; Tamanrasset, Ouargla, Bechar, Hassi Messaoud, Ghardaia, El Oued, Algeria; Timbuktu, Mali; Agadez, Niger; Ghat, Libya; and Faya, Chad. ↑ Christopher Ehret, The Civilizations of Africa: A History to 1800 (Charlottesville, VA: University of Virginia Press, 2002). ↑ Fezzan Project - Palaeoclimate and environment. The Fezzan Project: Geoarchaeology of the Sahara. Retrieved April 16, 2007. ↑ “Sahara's Abrupt Desertification Started by Changes in Earth's Orbit, Accelerated by Atmospheric And Vegetation Feedbacks”, ScienceDaily.com (July 12, 1999). Retrieved April 16, 2007. ↑ Kevin White and David J. Mattingly, "Ancient Lakes of the Sahara," American Scientist 94(1) (January-February 2006): 58-65. ↑ Hillary Mayell, “Desert-Adapted Crocs Found in Africa,” National Geographic News (June 18, 2002). Retrieved April 16, 2007. ↑ Predynastic (5,500-3,100 B.C.E.) InterCity Oz. Retrieved April 16, 2007. ↑ David Keys, “Kingdom of the Sands,” Archaeological Institute of America 57(2) (March/April 2004). Retrieved April 16, 2007. This page was last modified on 4 August 2015, at 14:44.